Once you have created an app-instance for your use and have performed basic configuration changes to your app settings, you can now proceed to the next step, which is to start defining Entities for your database. The home page of the app will show the steps you have completed and prompt you to add entities as shown below. Since the process of Modeling your Database would have given you a fair idea of how you want your database to be, you can directly click on the Add your Custom Entity link in step 3 (or you can click on Entities link under Admin to see a list of Custom Entities which at this point will be empty and click on the Add Entity button in that list view page) to proceed to add your entity details. The initial Add Entity Form will be like given below. Display Name : The name of the entity in singular. Spaces, hyphens, commas, unicode are all allowed. Example : Customer, Lead, Issue or Feature, Owner, Property, etc.,. Display Name Plural : The name of the entity in plural. Spaces, hyphens, commas, unicode are all allowed. Example : Customers, Leads, Issues or Features, Owners, Properties. Entity Index : Determines the listing order. 'Customers' can be 1. 'Issues' can be 2 and so on. It is also better to leave out slots to add new entities later. For example, Entity-A can have entity index of 5, Entity-B can have entity index of 10 and Entity-C can have entity index of 15. At a later date, if you want to add a new entity and want it to be between Entity-A and Entity-B, you can add that Entity-New with entity index of 12 and have it listed between Entity-A and Entity-B. Read Authorization : Which type of users can view the data of this type. Default is user. You can choose to allow guest users too or restrict it to admin users alone. Authorization Profiles can be used more fine-grain access control. Write Authorization : Which type of users can add/edit/delete the data of this type. Default is user. You can choose to allow guest users too or restrict it to admin users alone. Authorization Profiles can be used more fine-grain access control. 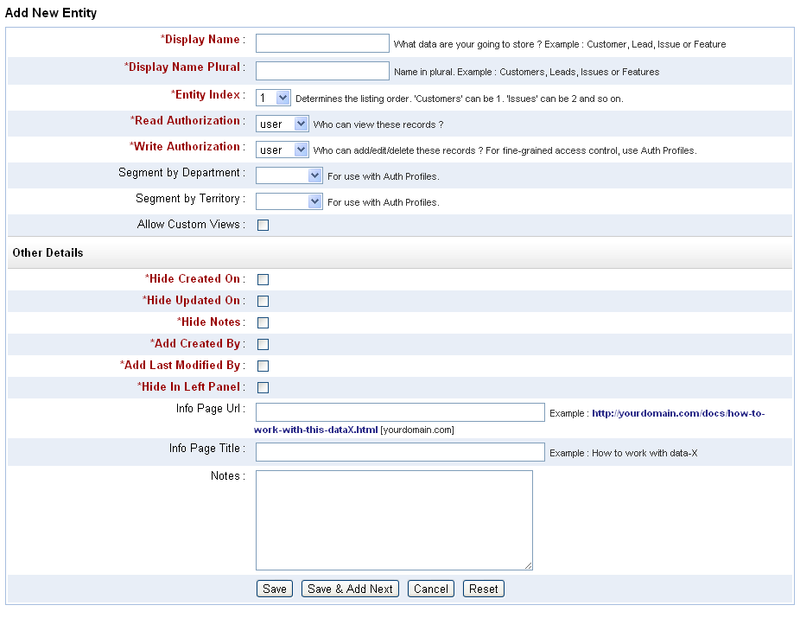 Segment by Department : For use with Authorization Profiles. When enabled, the records will have a department field with value from the user who adds the record. This field value can then be used to restrict the records based on departments. Allow Custom Views : Specifies if the users can be allowed to add their own custom views, which they alone can see, to filter records based on filtering criteria. Hide Created On : Specifies if the Created On field be shown in the app for this entity type. Hide Updated On : Specifies if the Updated On field be shown in the app for this entity type. Hide Notes : Specifies if the Notes field be shown in the app for this entity type. Add Created By : Specifies if an attribute needs to be added to this entity to store the reference to the user who created the record. Even without this option one can still track database changes using Audits. This specific feature is for cases where the user who created the record needs to be part of the record data itself. This field will not be shown in the forms, but its value will be filled in automatically. Add Last Modified By : Specifies if an attribute needs to be added to this entity to store the reference to the user who modified the record lately. Even without this option one can still track database changes using Audits. This specific feature is for cases where the user who last modified the record needs to be part of the record data itself. This field will not be shown in the forms, but its value will be filled in automatically. Hide In Left Panel : Specifies if the entity needs to be hidden on the left navigation panel. If hidden, one can still reach the list views from the related-records views if this entity has reference attributes to other entities visible in the left panel. Info Page Url : The URL to the page containing some help contents to help working with this entity. Info Page Title : The title for the help link. Notes : Other details about this entity, stored for those who might work with this entity configuration later on. 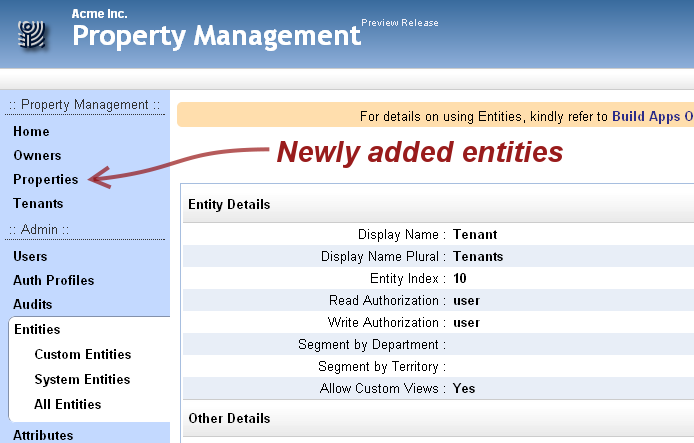 For our property management app, we will be adding entities for Owners, Properties and Tenants. We will proceed to add them one by one. First up, for Owner we provide the names in singular and plural and also allow creation of custom views, as shown below. Now click on Save and Add Next button to save this entity detail and proceed to add the next entity, Properties. We want Properties to be listed below Owners, so we will provide an Entity Index of 5 (higher than the Entity Index of Owner, which was left with the default value 1). The form filled in before adding Properties will be like given below. Proceed to Save and Add Next to add the Tenant entity. This entity will be listed below Properties and hence will have an higher Entity Index value of 10. Click on Save. You might have already noticed that as you add the entities, they will be listed on the left side below the Home link. So, once the three entities have been added, you will see them all listed on the left as shown below. Clicking on the links on the left will take you to the default list views for those entities, showing the default attributes like shown below for Owners. And, clicking on the Add Owner button will bring up a form like shown below. The home page of the application will now show the entities that have been added and will prompt you to complete the next step. The next step is to add the required fields to the entities.